After a seemingly catastrophic preseason, the New York Jets came pouring out of their clown car at 1 p.m. yesterday in waves, swarming into the end zone, burying the Buffalo Bills. The team that couldn't score in exhibition games put up 48 points, the most the Jets have scored since Brett Favre was at quarterback. Mark Sanchez threw downfield with ease; recent draft picks looked fast and spunky and effective. It's also when Rex Ryan's teams seem to excel. The Jets went 6-2 in the 1 p.m. slot last year. At 4 p.m., they were 0-3. On Sunday nights, they were 1-2. They did win on a Monday night, against Miami. And Thursday night? Ah, right. This is partly explained because 1 p.m. games are usually against weak opponents. But Rex Ryan's Jets play best when expectations are low. Those playoff runs in '09 and '10? They weren't supposed to win those four playoff games. Last year, on the other hand, turned into a smoldering mess after the Jets were finally expected to be great. Their last two Sunday-night performances against the Ravens and Patriots were the sort of games that get you booted from national TV (the Jets are scheduled for Sunday night this year only once, in late December). So yesterday felt like a private little game. Stephen Hill, the tall and fast second round pick out of Georgia Tech looked like Al Toon; Jeremy Kerley's size and hands made him look like Wayne Chrebet. Austin Howard stuffed Mario Williams, and all was well and the offensive line was tight. Lots of this, naturally, has to do with the Bills (and Williams's effectiveness—he hasn't had double-digit sacks in four years). Darrelle Revis, Antonio Cromartie, and Kyle Wilson all got easy picks. The Bills secondary was a mess. It's no wonder that Ryan told the Jets in a private Saturday night meeting that they would put up 50 against Buffalo. They knew they had this game in the bag. Despite the Bills playing like the Bills, there were a few bits of less encouraging foreshadowing. When C.J. Spiller ran for 56-yard touchdown, Bart Scott and LeRon Landry looked sloooow.The Jets' linebackers and safeties are still going to be owned by tight ends. And, yes, Sanchez will still make dumb decisions. Let's see, was there anything else? Any other players on the Jets who people are interested in? Oh, right, the second-string quarterback. This was the best news yet for a Jets fan: Tim Tebow was an afterthought. There he was, the NFL's most hyped player, doing anything but throwing the football. 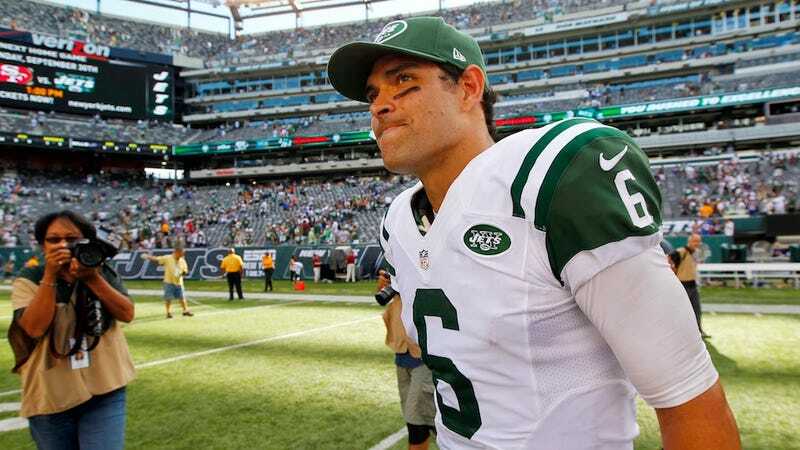 Sanchez looked as happy and secure as ever; Tebow looked a little bored on the sideline. Given the effectiveness of Sanchez—and Nicholas Dawidoff's reporting from today's New Yorker—it suddenly seems possible that the team wasn't lying when it said that Sanchez is the starter, and Tebow is just hanging around to be a football-player at-large. As long as Ryan remains convinced that Tebow can't throw the ball, Tebowmania may be a transient disorder. Maybe the Jets finally have things under control.